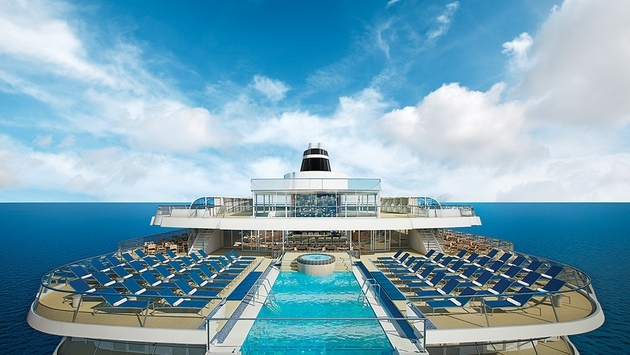 PHOTO: The new Viking Star will feature a striking infinity pool when it debuts in April. What is the state of the luxury cruise industry today? It’s “very healthy,” says Rick Meadows, who should know, since he’s president of both Seabourn and Cunard Line-North America. And the upper-premium and luxury lines are indeed offering more unusual and memorable experiences to meet that growing desire among well-heeled travelers. Here’s a round-up of the latest features and programs offered by the upscale cruise companies. 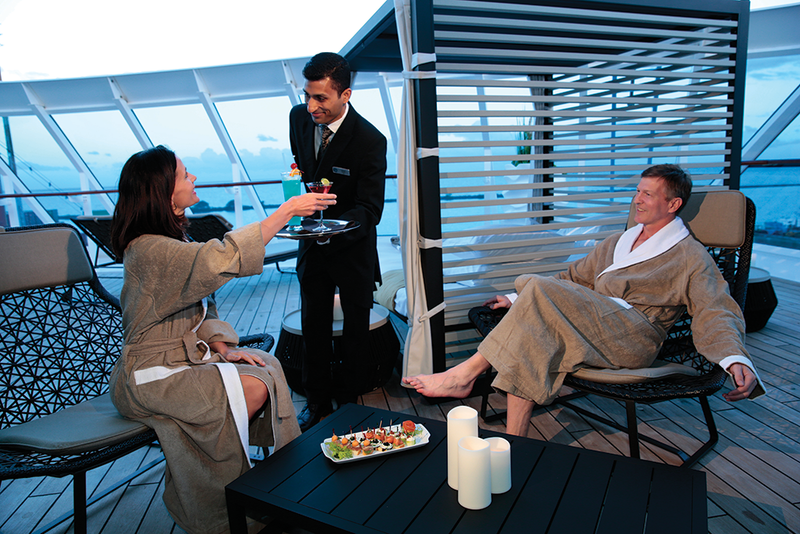 PHOTO: Azamara’s new “Nights in Private Places” includes lounging in bathrobes while sipping champagne and nibbling appetizers. Azamara is offering a new experience called “Nights in Private Places” onboard the ship, perfect for romantic milestones, including engagements and honeymoons. The experience includes private access to the ships’ thalassotherapy pool area, lit with dozens of candles, for a soak while sipping champagne and nibbling chocolate-covered strawberries. After exiting the pool, wearing robes and slippers, guests are served cocktails and canapés by their private butler. Accompanied by fine wines, dinner is prepared tableside. Following dinner, guests are offered cordials and petit fours. Celebrating its 25th anniversary this year, Crystal is offering parties and receptions and European voyages hosted by resident Edie Rodriguez and company Chairman Nobuyoshi Kuzuya. For those who want to catch up on sleep on their vacation, Crystal now offers “Late Risers” excursions that depart at 11 a.m. or noon. In response to travelers who want to stay active on vacation, Crystal offers new “site-running” adventures, which keep guests moving while sightseeing. Among new developments at Cunard is a partnership with venerable jazz label Blue Note Records. The result will debut on the Queen Mary 2’s trans-Atlantic crossing departing Oct. 29. That voyage will feature jazz performances by the Blue Note 75th-Anniversary All-Star Band, formed for milestone anniversary in 2014. Blue Note president Don Was, who is a celebrated musician and Grammy-winning producer for Bonnie Raitt and the Rolling Stones, will also sail on the voyage and participate in Q&A sessions. Two more Blue Note jazz cruises will be held in 2016. Also of note is a special cruise featuring Emmy and Golden Globe-winning actress Jane Seymour. She will sail on Queen Mary 2’s June 3 trans-Atlantic crossing from New York to Southampton. This company is offering an onboard beverage credit for new bookings on the Europa 2 and the Hanseatic. The beverage credit is $114 per person for a cruise up to six nights, about $171 for seven- to nine-night cruises, and about $228 for 10 or more nights. This upper-premium line is getting a new ship in 2016. The Sirena, a sister to the 684-passenger Insignia, Regatta and Nautica, will undergo a 35-day, $40 million refurbishment in Marseille, France, before entering service in late April 2016. For 2015, Oceania has planned a special sailing with Jacques Pépin, who is the line’s executive culinary director and oversees a bistro bearing his name on the Marina and Riviera. He will host the July 7 voyage on Riviera with his wife, Gloria, daughter Claudine, who is co-host of the “Cooking with Claudine” television series, and granddaughter Shorey. This two-ship luxury line is offering two new itineraries in 2015. A 10-night roundtrip Fiji voyage on the 332-guest Paul Gauguin departs Oct. 31. Also, a seven-night roundtrip from Venice, Italy, on the 88-guest Tere Moana departs Aug. 1. Special guests in 2015 include Hawaiian singer Jamie Lawrence on the Oct. 17 sailing to Fiji, Tonga, Cook and Society Islands aboard the Paul Gauguin; opera singers Catherine Cook and Kristin Clayton on the Gauguin’s July 29 cruise to the Society Islands and Tuamotus; and Parisian celebrity chef Jean-Pierre Vigato aboard the Gauguin’s April 29 Society Islands and Tuamotus voyage. What’s more, renowned oceanographer and environmentalist Jean-Michel Cousteau will accompany several Gauguin cruises in 2015. This French cruise line wants to grow internationally and brought aboard Navin Sawhney as COO to spearhead development in North and South America. The company also recently formed a brand called Ponant USA, offering Ponant Cultural Cruises and Expeditions onboard its fleet of small cruise ships. Ponant says it intends to become the first luxury cruise line to develop enrichment programs with a focus on cultural voyages and expeditions to all seven continents. The 122-stateroom Le Lyrial will join the line in May. It will berth in ports accessible to small-capacity ships in the Poles, Northern Europe, Mediterranean, the Caribbean, Central America, South America, Asia and Oceania. 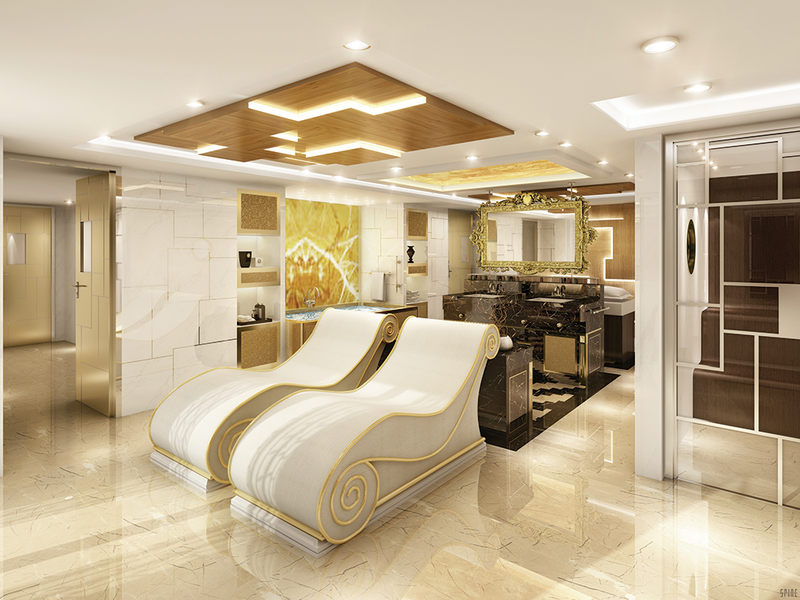 PHOTO: The massive Regent Suite on Seven Seas Explorer will have its own in-room spa retreat. Among its features is the two-bedroom, 3,875-square-foot Regent Suite, which will have an in-room spa retreat with sauna, steam room and treatment area. Regent also entered into a new partnership with the Smithsonian Institution to create a new guest lecture series. The Smithsonian Collection by Smithsonian Journeys will feature a range of experts and begin in July. This luxury line also is planning to expand, introducing the Seabourn Encore in late 2016 and Seabourn Ovation in 2018. Both ships will accommodate 604 guests, based on double occupancy, in all suites. Many of the ships’ public spaces are being designed by hospitality design expert Adam D. Tihany. This two-ship line, which offers a “yachting, not cruising” experience, is offering Mediterranean sailings that explore smaller ports and harbors in countries such as Croatia, Greece and Italy. These immersive voyages call on up to nine ports in a single country and often include overnights. 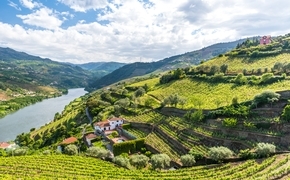 After the successful debut of wine voyages last year, eight vino-intensive voyages have been added to the 2015 season with wine tastings, classes and a Winemaker’s Dinner paired with wines of the winemaker joining for the evening. PHOTO: Silversea’s all-suite luxury adventure ship Silver Galapagos completed its final phase of renovations. Silversea Cruises is offering more inclusive features — shore excursions and Wi-Fi access — on its 52 Mediterranean cruises this year. Guests can choose from included Silver Shore Select excursions in every port of call and also get two hours of complimentary Wi-Fi access per guest, per day, and unlimited complimentary Wi-Fi access for the suites in the Medallion and higher categories. 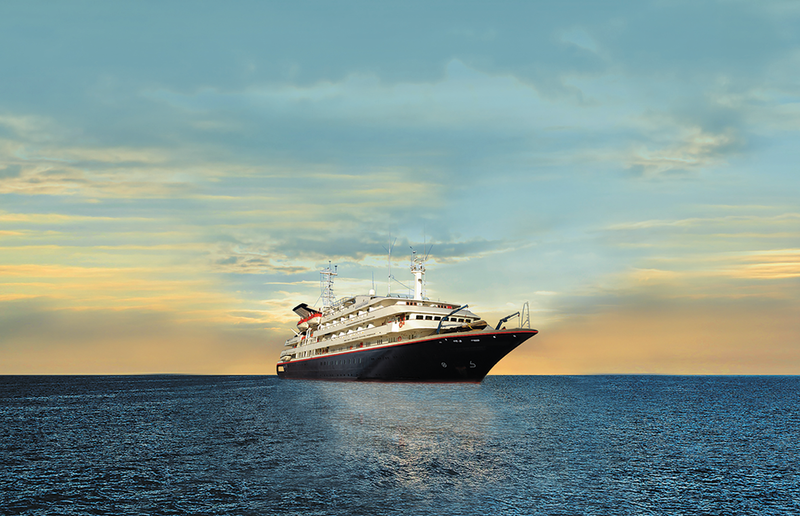 In late 2014, the all-suite luxury adventure ship Silver Galapagos completed its final phase of renovations. All of the ship’s suites, corridors and the Explorer Lounge were completely refurbished. In April, the new cruise line will officially launch with its first vessel, the 930-passenger, all-veranda Viking Star. The light-filled ship features modern Scandinavian design and standout features such as a glass-backed infinity pool, a “snow grotto” in which snowflakes descend from the ceiling through chilled air, and the two-deck Explorers’ Lounge with double-height windows. A sister to Viking River Cruises, the new ocean line developed itineraries with maximum time in port so guests can experience local nightlife. Cruise fares include a veranda stateroom, shore excursions in each port of call, all onboard meals, port charges, beer and wine with lunch and dinner, Wi-Fi access and more. This casual but upscale line increases its fleet from four to six yachts in May when it takes two more of the former Seabourn ships. Both yachts will undergo a $17 million, three-week dry-dock in Genoa, Italy, before christening ceremonies in May when they will be officially named the Star Breeze and Star Legend. Also, starting this year, every Windstar itinerary will include a complimentary onshore Private Event. A version of this article appears in print in the March 2015 issue of Vacation Agent Magazine.